Here, then, is the sixteenth instalment of the story of how Mary Jones and Thomas Charles triggered a mission to the world. On December 16 1864, now very weak, Mary Jones celebrated her 80th birthday. 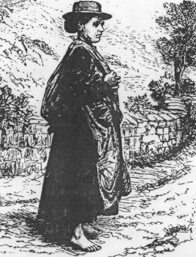 A fortnight later, on 29 December, with a few friends from Bethlehem chapel at her bedside, Mary died in the little hamlet of Gwyddelfynydd, just north of Bryncrug. The Bible presented to her by Thomas Charles which she had kept for her personal use was on her bedside table. She left instructions for it to be given to Robert Griffith. Griffith later gave the Bible to Robert Oliver Rees of Dolgellau to be repaired before being sent to Bala College. This copy is now housed with the Society’s collection at Cambridge University Library. You can read in the Bible what Mary wrote at the end of the Apocrypha. Mary Jones was born 16th of December 1784. I bought this in the 16 year of my age. I am daughter of Jacob Jones and Mary Jones his wife, the Lord may give me grace Amen. Mary Jones is the true owner of this Bible. Bought in the year 1800 aged 16. Robert Griffith conducted Mary’s funeral service, taking as the text for his sermon the last verse of Psalm 17: “As for me, I will see Your face in righteousness; I shall be satisfied, when I awake in Your likeness.” They buried her in the churchyard of Bethlehem Chapel, Bryncrug. Her grave, with a stone erected by those who wished to preserve her memory, is today well preserved in the neatly-kept graveyard on the banks of a stream. Mary is still one of the better known of all Welsh women, both within Wales and internationally. Apart from the unique nature and best-selling record of the Bible itself, one of Bible Society’s most successful single items of publicity has been the tale of Mary Jones. Since it was first published at length in English in 1882, the story has never been out of print. By 1890, the English edition of the story had sold 95,000 copies and since then it has been translated into over forty languages. The story has been told not only in books but in plays, musicals, filmstrips, flannel graphs, tea-towels and on the internet. It is ironic that this massive publicity should centre around a lady who was unknown outside a small circle when she died.